NEED DONATIONS TO HELP GET IMMEDIATE MEDICAL RESCUE! EVERY MINUTE COUNTS FRIENDS. WE NEED TO ATTRACT RESCUE NOW ! This 2 year old un-neutered male Retriever mix just arrived at Animal Care as a stray after being hit by a car JUST AN HOUR BEFORE CLOSING ! He is very sweet, weighs 47 lbs, and has been gentle on examination but he has a badly fractured back leg. This sweet dog came in wearing a collar and is possibly owned but needs IMMEDIATE medical rescue so that he can get treatment for his injuries. If you can help RESCUE, please contact rescue@broward.org. His animal id number is A1812750. POOR HENRY UPDATE: Henry has now had his <3 5TH SURGERY to save his leg! <3 The current setup is to help support the bones, so they can regenerate. Rescue WON'T GIVE UP on Henry, and I know WE WON'T EITHER ! <3 Please pitch in, Rescues cannot continue without out help, and Henry is counting on us ! Henry's 5th Surgery to Save his Leg ! FINAL SURGERY UPDATE: We've HELPED HENRY come a long way. 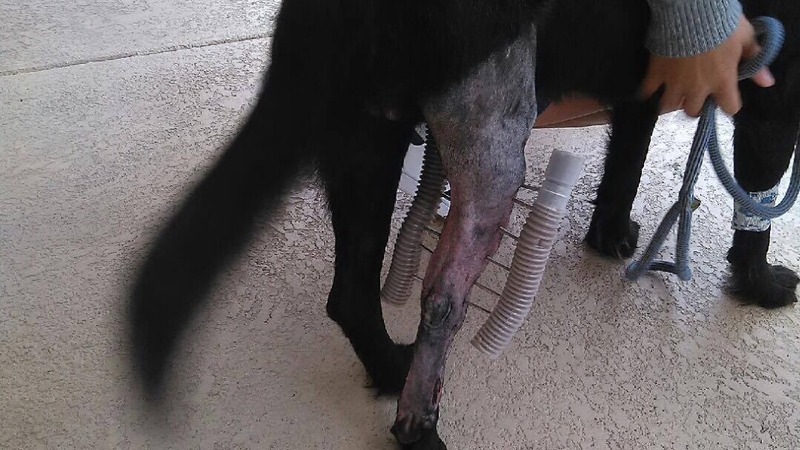 Rescue needs our help with his final surgery. Thanks to all the Angels who pitched in, he didn't lose his leg ! Can't let him down now - please pitch in for his final surgery ! HENRY UPDATE: Finally ! He can have the plate removed from his leg ! 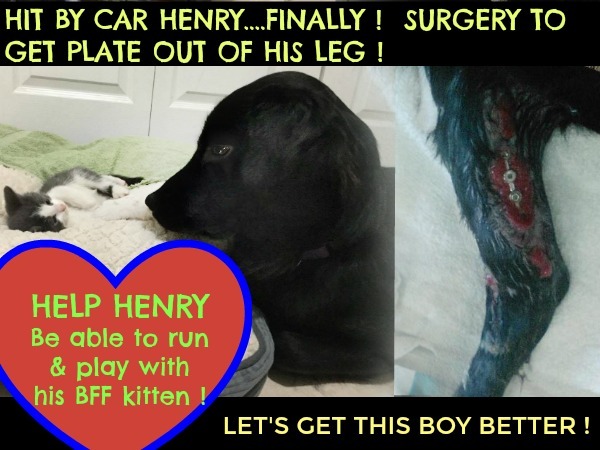 Please pitch in to help this last surgery -- Henry lays and plays with his BFF kitten buddy, but can't get up to play. Let's get this boy better ! Thank you Angels ! Henry wants to run & play again! HENRY, so sweet with Kitten! OH HENRY !! Pulled out his staples and had to have surgery again today. Posting a photo, hope its not too graphic, can't believe he made his screws show through ! Please pitch in friends, let's get this boy well !!! Any fosters out there? Plate and screws surgery was completed yesterday. Sweet Henry has to get through the recovery, including the secondary infection worries. We did not fill the fundraiser yet, so anyone who can pitch in a few dollars to help cover costs please do -- Rescues can't save these dogs, or other dogs, unless they get our help. Thank you EVERYONE ! ! 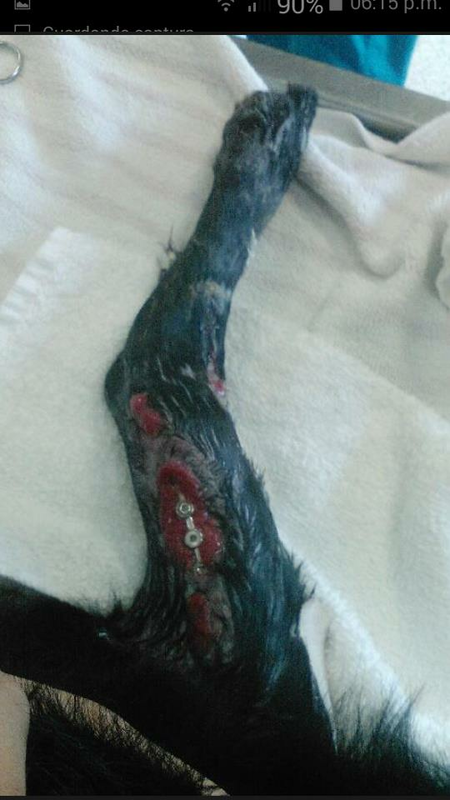 Poor baby, already infected and will need plate & screws to save his leg ! 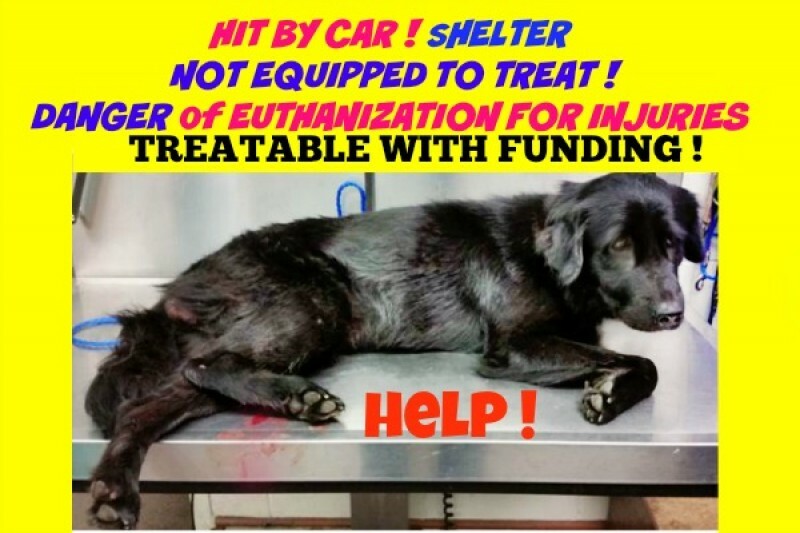 Please help fill this fundraiser, he will need it with this complex injury and infection ! Henry looks just like my first rescue dog MollyBee - a very sweet dog. Henry has come this far, we can't give up on him now. Please donate ... or donate again :) ... and SHARE for others to donate! Let's all do a drop more to help. He's come so far. Let's send to some friends and ask for just $5 or 10 to help with the medical bills.